For many of us beauty girls (and guys out there too!) 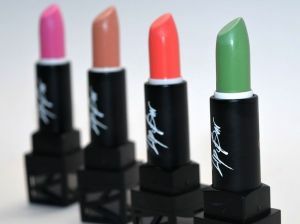 lipstick is a staple product that we go to for that POP to finalize our look, day or night. Since my lips are one of the most prominent features on my face, it’s important for me to find the right color that accentuates them! I’ve always been very into metallic, bold and unique lip colors, but sometimes the commercial and high-end brands just don’t push the limit enough for me. Luckily, in the past year I’ve discovered these cult beauty brands that have exactly what I’m looking for--everything from deep purples to canary yellows (and much in between). Conveniently, a lot of these brands are both safe and effective, so while you’re looking glamorous—you won’t have to worry about any harmful ingredients going into/onto your skin! I’ve come up with a list of independent beauty brands that will cater to the glam in all of us. I mean, the slogan here is just everything! Sick of red lipstick? Then Portland Black is the brand for you. They offer several seductive, unorthodox shades including badass metallics. Best of all, their specialty is the “Original Black Lipstick” which is very opaque and extremely sultry. Unlike Melt Cosmetics, they don’t feature many swatches on their website, but luckily they package samples of all of the colors for $2.00 so you can be sure to find the perfect match. Happy lipstick hunting!! And now some special words of lipstick wisdom courtesy of The Lip Bar. If not close to a mirror, be sure to assign a designated lipstick-watcher. Otherwise, accidents could happen. Never ever leave home without it. When eating, be sure to re-apply lipstick immediately after. A face without lipstick is no face at all. Never do-up the eyes and the lips at the same time. Bright lips and natural makeup are the best of friends. Never get lipstick on your teeth. That's reserved for the Grannies. Don't apply and drive. It could be dangerous. Never deny someone where you got your lipstick. Share the beauty! Alternatively, never share your lipstick. Your friends are trashier than they let on. Never be afraid of color. Beauty is art and your face is your canvas. When in doubt, reapply. A little moisture never hurt anybody.